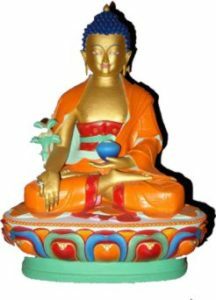 At one time when the Buddha Shakyamuni was in Vaisali, he was approached by the great Boddhisattva Manjushri who requested him to teach on a great being of very ancient times, the Medicine Buddha. The medicine Buddha appeared in the sky in front of them before a large crowd of desciples and introduced his vows to save all beings from illness and suffering. Since then, in all lands where the Mahayana tradition of Buddhism is taught, Buddhists have used his meditations and mantras to seek freedom from illness and to develop healing capacities. In Sanskrit he is known as Bhasajyaguru, (which means ‘Master of Healing’) and his personal name is Vaidurya-prabha-raja (which means ‘King with the Light of Lapis Lazuli’). Physicians of Tibetan Medicine are trained to develop compassion through particular meditations which come from the Medicine Buddha. This developed compassion is the basis in which they relate to their patients. In old Tibet emchis were sent into regions with epidemics to treat the victims, and they had no innoculations and yet didn’t fall prey to the epidemic illness, due to their compassion developed through these meditions.